The Champions League has already blessed us with some mouth-watering ties early in the season. And last night we witnessed another thriller as Liverpool hosted the Italian side Napoli in a do-or-die situation. 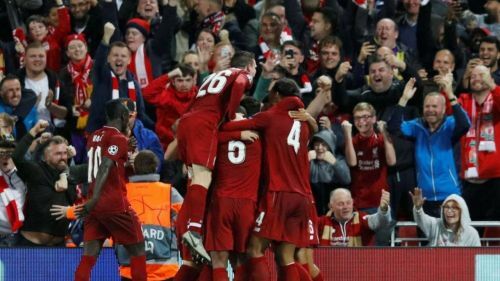 Though the odds were not against Liverpool, they still had to put their best foot forward to survive in the Champions League race. Jurgen Klopp's men started the game aggressively and looked to dominate Napoli in the early stages. The Italians seemed too slow to cope with Liverpool's pace and precision. Liverpool threatened Carlo Ancelotti's defense with quick counter-attacking movements off the ball, helping them find time and space. They broke the deadlock when Mohamed Salah scored the decisive goal in the 34th minute. Milner found Salah on the run, who left Kalidou Koulibaly for dead by wrong-footing the defender before nutmegging Ospina. The Egyptian scored his 35th goal in his last 38 Anfield appearances with the strike. But a one-goal lead was not enough for the home side as they had to win by a two-goal margin if Napoli scored. Klopp was getting furious on the sideline when his team was missing clear opportunities to go 2-0 up in this must-win contest. Sadio Mane was having a bad day at the office and failed to settle the nerves at Anfield as many chances went begging. Napoli too lacked the finishing touch and were unable to break the deadlock even after creating many good opportunities in the match. The best chance for Ancelotti's men came in the dying moments of the game when Milik found himself in front of goal eight yards out, deep into four minutes of added time. Anfield held its breath as Milik was on target, but Alisson matched his shot with an equally brilliant save and made sure that the Reds crossed the line. The Brazilian saved the day for Liverpool, justifying his £67million tag. Later Klopp said in the press conference, "If I knew Alisson was this good I would have paid double." "The goal Mo scored - what a goal, unbelievable - but the save Ali [Allison] made, I have no words for that. That was the lifesaver tonight." The kind of form Liverpool are in, this could well be the year when they finally end their silverware drought. Currently the Premier League leaders, they will now look to continue their sparkling display of football in Europe. Liverpool have all the ingredients to win trophies this season - from a stellar attack to a formidable defence to a world-class goalkeeper. It remains to be seen if Klopp & Co can change the team's fortunes and bring home their first major trophy since 2006.